MBC TV series The Moon Embracing the Sun staring Kim Soo Hyun, Han Ga In, Jung Il Woo and Kim Min Seo has gained popularity that is rarely seen for recent Korean dramas. There are many reasons that contributed to the popularity of The Moon Embracing in the Sun, other than cliffhanging story plot and excellent acting, the attention the producer paid to the fine details also a main factor. Recently, the implied meaning of the background design of The Moon Embracing the Sun poster is uncovered. The background pattern of The Moon Embracing the Sun poster is actually the similar image with the pattern that appears on the front of banknote of 10,000 South Korean won. The photo is based on Irworobongdo (일월오봉도 / 日月五峯圖), or literally, Painting of the Sun, Moon and the Five Peaks, a highly stylized landscape painting of a sun and moon, five peaks together with lake and waterfalls which in between always was set behind Eojwa, the king’s royal phoenix throne during the Joseon Dynasty. Irworobongdo is also called Irwolgonnyundo (일월곤륜도 / 日月崑崙圖). The Irworobongdo painting appears below the wording of 만원 in 10,000 South Korean won banknote. 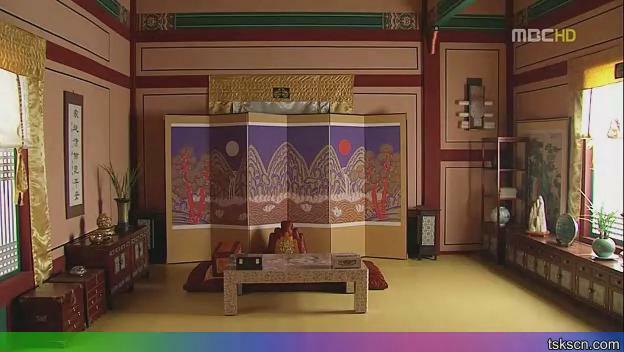 The Irworobongdo that appears in The Moon Embracing the Sun drama, inside the bedroom of the King Lee Hwon. Irworobongdo folding screen in National Museum of Korea. 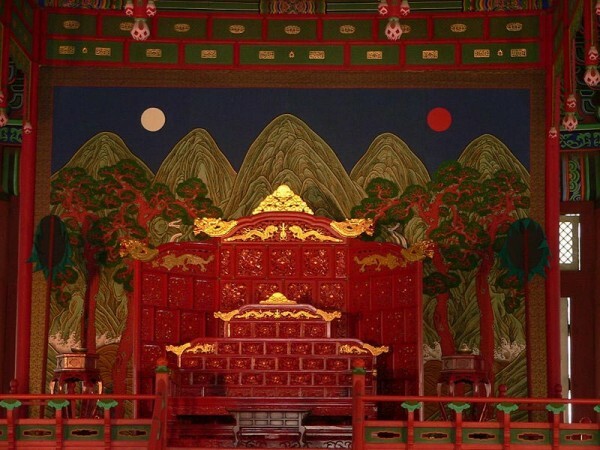 Historians suggested that the Sun, Moon and Five Peaks screens were one of the most important elements in the throne hall which been used from mid-seventeenth century, and that this formalized landscape illustrates the Joseon political cosmology. The “almost” red sun represents the king as the yang, the positive male principle, while the white moon represents the queen as the yin, the negative female principle. These two principles make the universe work. The image in The Moon Embraces the Sun’s poster also includes additional sun and moon in the form of inverted reflection in the water. Nonetheless, the use Sun, Moon and Five Peaks pattern as the background of the official drama poster heightens interestingness and mystery surrounding the drama.